Things I liked: I like being able to see my pellets. Things I liked: Works perfectly, just like the original that came with the rifle. What others should know: Not really, it's a spare magazine. Things I liked: Vey nice operation, easy to load and use. Things I would have changed: Price and a way to prevent an empty cycle without having to count shots. What others should know: Good product with just one shortcoming AND high price. Things I would have changed: Price seems high. Things I liked: The functional simplicity of loading and indexing. Things I would have changed: A shot indicator of some sort to keep track of pellet count. What others should know: Kind of a tight fit, but that's okay in my book. Things I liked: Easy to load, you can see how many shots are left. Things I would have changed: A band around the magazine to stop the pellet for falling out when not in the gun. What others should know: Seems like the price is a bit much for no more than you get.. Things I liked: Reliability, durability and simplicity. I've dropped my magazine a few times and it had no issues. It cycles very smooth. It's design will make it last because it's not spring loaded to make it cycle. Things I would have changed: Make it less expensive, it's not gold plated ya know! What others should know: Get a couple of these with your air arms, loading is not fun so it's good to have enough mags for your hunt. Things I liked: Works well and easy to use. Rotates very smooth and haven't seen any issues with accuracy using the magazine vs loading single rounds. Things I would have changed: Price is double other manufacture repeater magazines. What others should know: The last pellet will fall out once you fully load the magazine unless you put it in the receiver or if carrying it in your gun case or pocket you need to rotate the wheel have way between the loading hole to prevent this. Just remember to index the loading hole properly before installing it into the receiver. Things I liked: Pellets load easily, loads into the rifle, smoothly. What others should know: Must be aligned properly in breech port, to snap in place. Things I liked: It's smooth operation. No spring and not spring loaded I must say like the Evanix. Transparent yellow plate allows you to view your pellets. Very easy and simple to load. Things I would have changed: I don't know how else to improve rubber O ring retainer that holds pellets in place. They tend to break after several years of use. I mean use as in use. Mine lasted about 2 years over 2000 rounds. What others should know: Pyramid air is so generous. After mine broke, I called them up to order the retainer rubber expecting a $$$$. I was told by Derek, he'll mail me 3 "O" rings free of charge. That's great. Ever since I have been their customer, they have always readily able to help me with my problems and replacement parts. Pyramid air is so reputable company as far as my experience is concerned. I'll be looking forward to my "O" rings and have endless fun shooting my air arms 510. Thanks Derek. Things I liked: It's smooth operation. No spring and not spring loaded I must say like the Evanix. 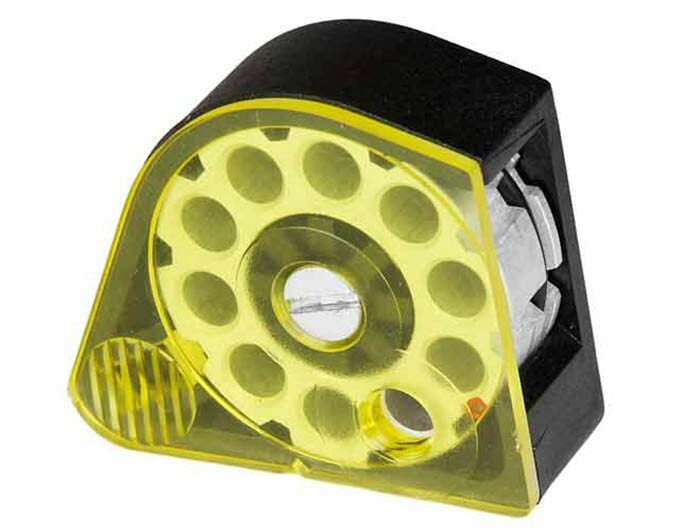 Transparent yellow plate allows you to viewyou pellets. Very easy and simple to load. What others should know: Pyramid air is so generous. After mine broke, I called them up to order the retainer rubber expecting a $$$$. I ess told by Derek, he'll mail me 3 "O" rings free of charge. That's great. Ever since I have been their customer, they have always readily able to help you with your problems and replacement parts. Pyramid air is so reputable company as far as my experience is concerned. I'll be looking forward to my "O" rings and have endless fun shooting my air arms 510. Thanks Derek. What others should know: Seeing how much it costs, these should already be tested and guaranteed to fit perfectly to the rifle. Things I liked: loading is easy. Things I would have changed: It would be nice if there was slide on the mag to keep a pellet from falling out when it was in my pocket. What others should know: sometimes it's difficult to insert the mag. in the air gun. Things I liked: Everything, this is the nicest clip out there. Its light, protects pellets from getting wet or dirty while hunting or shooting in nasty conditions. What others should know: Grab a spare for fast reloading, and if hunting you wont have to carry along that rattling tin of pellets. Things I liked: This magazine is easy to load. The pellets drop right in the open slot nose first and need no further manipulation. Turn the wheel with your finger to engage the next open slot. The plastic magazine seems durable and I have never had a malfunction. What others should know: Wish they were cheaper. Things I would have changed: Wish you could buy the metal ones that come with the 30th Anniversary guns!